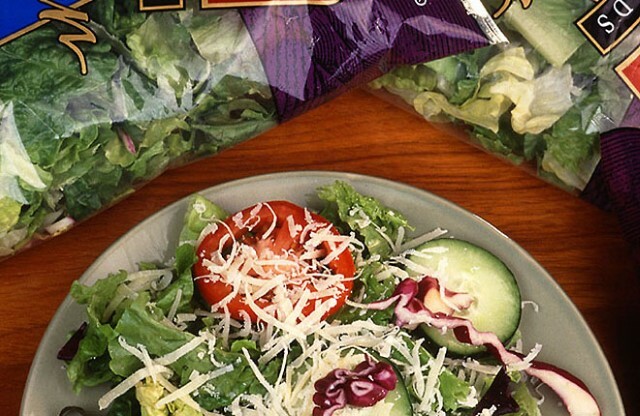 ARS scientists developed imaging technologies to detect decay in bagged cut lettuce. Click the image for more information about it. Fresh-cut lettuce sold in bags is a desirable yet highly perishable product because tissue decay can start a few days after processing and is difficult to detect through the bag with the naked eye. Agricultural Research Service (ARS) plant geneticist Ivan Simko, with the Crop Improvement and Protection Research Laboratory in Salinas, California—in collaboration with researchers from Australia—designed a system for the early detection and evaluation of decay. The researchers developed two lettuce-decay indices to help select breeding lines yielding longer-lasting cut lettuce. The indices also allow researchers to identify lettuce damage caused by freezing temperatures. One index is based on evaluations performed with hyperspectral imaging, and the other with chlorophyll fluorescence imaging. A hyperspectral sensor identifies decay by measuring light waves that bounce off plant tissues. Unlike the human eye, which sees only visible light, hyperspectral imaging detects a much broader electromagnetic spectrum-including the ultraviolet, near-infrared, and infrared regions. Chlorophyll fluorescence imaging measures biological activity in leaf tissue and uses light re-emitted by chlorophyll to find decay. The cameras used in these two technologies mimic human sight while avoiding subjective errors, according to Simko. In turn, the researchers can test breeding lines for longer shelf life and breed that trait into current lettuce cultivars grown for processing as bagged produce. This research appeared in Postharvest Biology and Technology in April 2015. Read more about this research in the April 2016 issue of AgResearch. ARS is the USDA's chief intramural scientific research agency.